Still happy with my new used Denso. Made a world of difference. Did you get the bike Jeff and what did they say about the starter? Had slow cranking with several clicks and required 3-4 presses of the starter button, especially with the engine warm or hot. Sometimes also accompanied by a flickering dash. Now the starter motor is change to Denso (104A). Bought a nearly new one on ebay for 190 USD. I had my starter motor replaced under warranty but still having issues with starting! 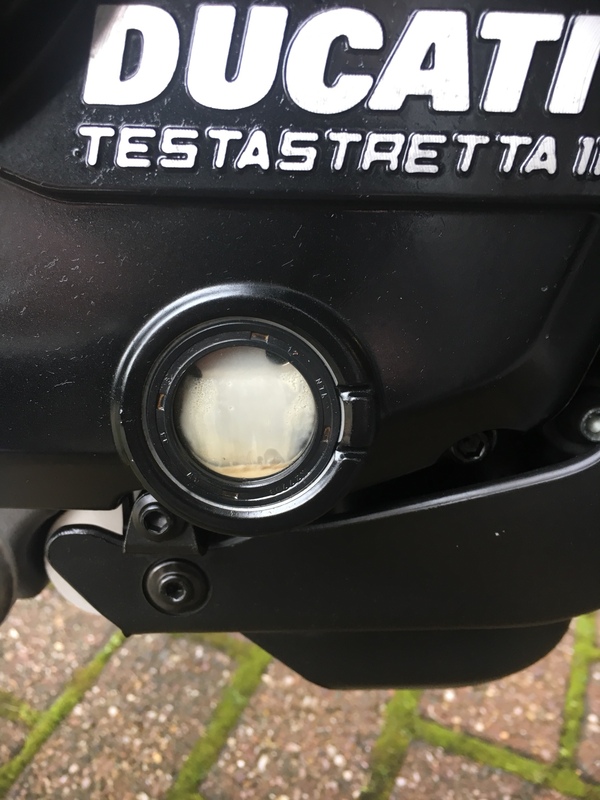 Also there is a lot of moisture in the engine I’ve had that oil and filter replaced but it has come back is this a result of the engine casing being removed and not sealed properly? basically this is a problem of driving only short distances without warming oil enough. moisture steams out when oil gets hot. That's your problem. Let the bike sit and idle after your ride, it should heat up enough to burn off condensation. I see the condensation on the window, but what about the oil itself, does it look ok? What about the coolant? That's the first thing to check, just in case. I agree it's the bike not getting up to temp. Let it idle a bit to heat up, or ride longer. I notice my Hyper runs very cool, so I'm not sure I'd go after the thermostat yet though it is a possibility that it's stuck open. How quick does it get to 60C? I have had this same deal on my bike that sits outside in rainy months and sees short riding trips. A longer, faster ride fixed it. If this was air cooled it'd be no worries, just short trips in cold weather like others have pointed out. All my bikes suffer from that in the winter, but I've never had chocolate milk oil cause a problem. Since our Hypers are liquid cooled, there's the chance of a coolant leak causing contamination of the oil, so be sure to keep an eye on your coolant level. If it's not dropping, you're probably ok.